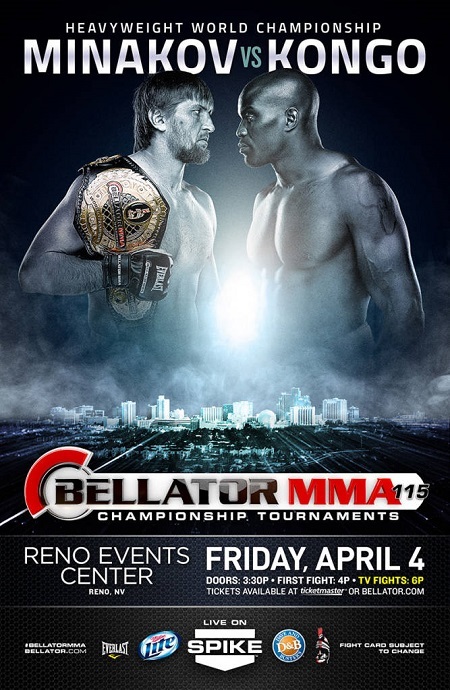 “Bellator 115: Minakov vs. Kongo” takes place Friday inside Reno Events Center in Reno, Nevada. Former UFC star Cheick Kongo challenges Vitaly Minakov for his heavyweight title in tomorrow’s featured attraction. A pair of semifinal bouts that were slated to appear in the main card were scrapped at the last minute. The welterweight fight with Andrey Koreshkov and Sam Oropeza was called because Koreshkov came down with the flu, while the middleweight bout with Jeremy Kimball and Dan Cramer was pushed back to a later date because Kimball missed weight. Spike.com streams the preliminary bouts live at 7PM ET/4PM PT. Spike TV airs the main card at 9PM ET/PT.